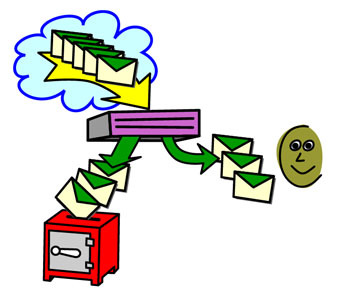 Email archiving is in high demand and organizations are asked to keep record of all sent and received email messages due to ever changing local, state and federal compliance guidelines. MessageGuard is a complete and affordable email archiving solution, enabling you to maintain all of your organization’s emails in order meet your regulatory compliance needs. We offer a free 30-day on-site demo of our MessageGuard appliance. If you would like to test MessageGuard at your business please complete this form. Web-based version integrated into WebMailPRO (Staff E-mail) and/or SchoolBits (Student E-mail). This version of MessageGuard requires no installation on your servers or workstations, just a computer with a web browser and an internet connection. Stand-alone service, or integrate with SecureSchool (Internet Filtering Appliance) and/or SpamTrakker (Spam Filtering). Runs on an appliance at your site integrated with your existing network. We are currently working on testing and integrating with other mail systems. If you don't see yours listed here, give us a call toll-free at 1-877-225-0100 and we'll see what we can do! For MessageGuard price quotes, use our rate calculator, or call our toll-free number at 1-877-225-0100, or send us an E-mail at info@isboss.com. Click to access our MessageGuard Signup Form. ISBoss.com ©1999-2019 Networks & More! Inc.